Knowing how to get to here is an important part of preparing for your race. For Driving and Transit directions to UBC, review the map below. • Diesel Bus Loop (99 B-Line, 25, 33, 41, 43, 49, and 480): The new UBC Bus Exchange, located off Wesbrook Mall at University Boulevard, is where you will be dropped off. However, that bus exchange is drop off only. All transit riders will board busses along Wesbrook Mall when leaving campus. See map below. 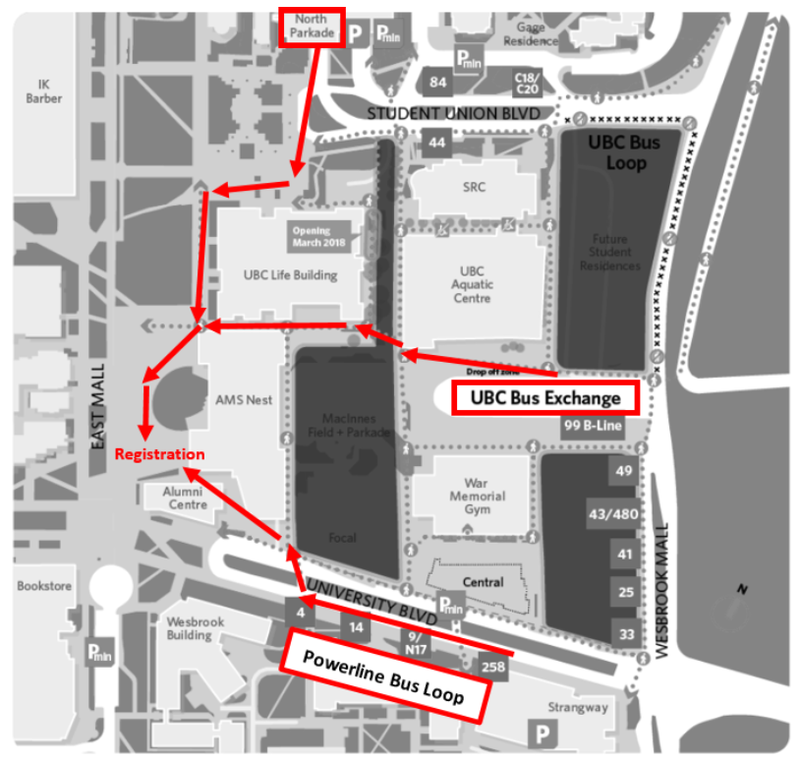 • To get to Registration from the new UBC Bus Exchange: walk past the Aquatic center and head towards the UBC AMS Student Nest and the UBC Life Building. Once you have passed both buildings, turn left and follow the signs for registration. See map below. • Small Powerline Bus Loop (4, 9, 14, 258): You will arrive and depart from the same location if you are taking any of these busses. To get to registration: cross University Blvd. using the cross walk and head towards the UBC AMS Student Nest. Once you have reached the Nest, take a left and follow the signs for registration (located in front of the Nest and the Alumni Center). See map below.